Based on the reporting I saw yesterday, which initially caused me to think that income had dropped only slightly, this is a widespread view. But it just isn’t true. 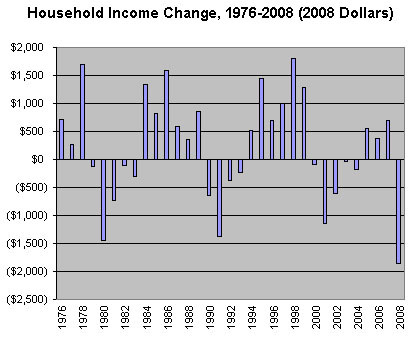 In fact, the 2008 drop in median household income was the biggest since the Census Bureau started tracking this stuff in 1976. Income dropped $1,860 in 2008, and the next closest competitor is 1980, when it dropped $1,439. Last year was the worst year for household income in both absolute terms and percentage terms in the past three decades. And, as Ezra says, that was only 2008. This year is likely to be as bad — or possibly worse. Income drops typically persist for several years during a recession, and the combined impact of this recession is almost certain to do more damage to middle class incomes than any recession since World War II.